Commercial & Residential Pest Control Hounslow TW | Quality Property Care Ltd.
Say goodbye to pests! And say hello to our understanding, polite and English-speaking pest management technicians from Quality Property Care Ltd.. Book a professional visitation by calling us on 020 3746 4287. Our kind consultants are available for you. We work every day of the week with no exceptions for bank holidays and weekends! Quality Property Care Ltd. offers professional home and office pest control services to all people and business in Hounslow TW and the area. We are experts in pest management and control. We are going to help you in dealing with pests and prevent them from appearing again. 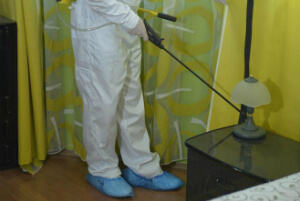 Every pest technician in the company is professional, trained. They are licensed to use the pesticides and various baits needed for handling the rodent or pest problems. We offer an option for a full guarantee pest control services. This includes free follow-up visits within Three months of the procedure. More than 7,000 happy clients will be happy to highly recommend the professional pest management services offered by the company. Don`t hesitate to contact us for any questions, at any time. You have a serious home or office pest problem and we fully understand and support you. This is why we will work fast and make everything we can to chase the pests away and keep them afar for the future. The pest technicians will use different methods depending on the pests. All treatments are safe, but it is recommended for you to be away from the property. Don't worry, the professional pest control service in Hounslow TW is 100% insured and the pest technicians are trained and vetted. Say goodbye to your pest problem once and for all with the professional pest control services of Quality Property Care Ltd. in no time. Our pest control technicians can deal with ant control, bed bug treatment, cockroach control, flea control, woodworm treatment, dust mite control, silverfish control, wasp control, bee control, spider control, moth control and carpet beetles control, fly control. We can also deal with rodents like rats, squirrels and mice. Apart from those we can also remove bird’s nests, and prevent and remove pigeon and bird infestations. Along with that we can also perform complete home and office fumigations. We find it that it’s first better to try a non-lethal approach. Before we begin with baits and traps, we first inspect the premise. Mice are small and leave tiny greasy trails that help them traverse your home, something like a mice-highway. With the help of these trails we find their nest and place baits and traps. If the infestation is too big, we will use lethal traps and poisons. Cleaning around the poisons is not recommended as it might disturb the pile. After a period of several days you can call us so we can come and check to see the outcomes. Carcasses are removed from the premise, the poisons have a 3 month protective period. Choose Quality Property Care Ltd. Pest Control and Get Special Price! You can arrange your expert pest control service right away by calling the phone 020 3746 4287 or sending an online booking request. The customer assistants will come back to you as soon as possible and send you a email confirmation. If the infestation is enormous and want to get rid of it immediately - there is a same day service at your disposal, so call now. No deposit is required. You will pay after the job is done. Book a guaranteed pest control service and get 2 free follow up pest control treatments and visits. Book now!